The EDRS and EDRS Pro Class Calendars have been published on the EDRS Race Calendar Page. In the documents, teams can see which classes are run at the different events. The EDRS 2016 include 18 events in Sweden, Finland, Norway, Denmark and Estonia. In 2015 more than 800 teams from 10 countries took part in the EDRS European Drag Racing Series, which is operated by Speedgroup. 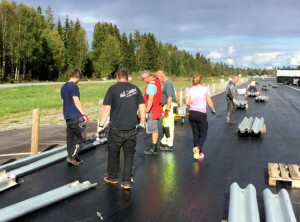 After long and hard administration work the activities to rebuild Gardemoen raceway are now at a very high level. When 2016 race season starts the racers are going to find a new surface at the racetrack with new fresh facilities in the plan throughout the season.